NOTE: You can pull this article up on your phone and zoom in on the pictures while you make the changes to your computer. Or save the pictures to your computer so you can view them while not online. A frustrating and unpredictable problem for internet customers is when their computer shows there is internet access, but the websites still won’t load. This problem has hit WOW customers several times this summer, but it can happen with any provider. We talked to Ryan Meray, owner of C! Tech Solutions, and of course he had the solution. “Despite their record for customer service, WOW has had a string of DNS outages frequently for the past 8 months as they’ve been making changes to their network. These outages seem to be random and unplanned, which makes it even more frustrating for their customers,” Meray said. When customers have a signal, but cannot connect, it can be a DNS issue. The solution is to instruct your computer to use a Google DNS. 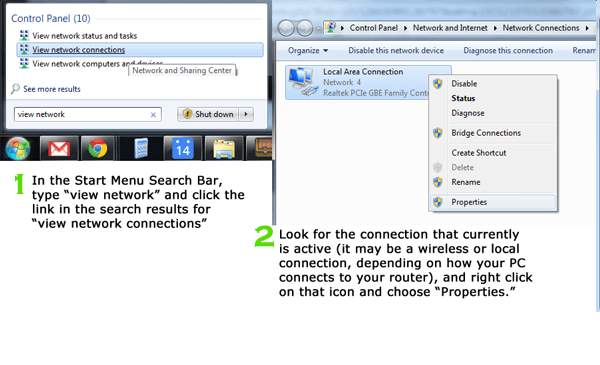 The pictures below show the steps for how to do this in Windows 7. For users of other systems, it won’t look exactly like this, but the steps are very similar. For preferred DNS Server enter 8.8.8.8 and 8.8.4.4. Meray explained more about DNS and why he recommends changing it. DNS servers are run by Internet Service Providers, like Comcast and WOW, along with other companies that don’t necessarily provide Internet service in your area, like Google or OpenDNS. If you do not change your settings, most likely your computer is defaulting to the Wow or Comcast DNS. 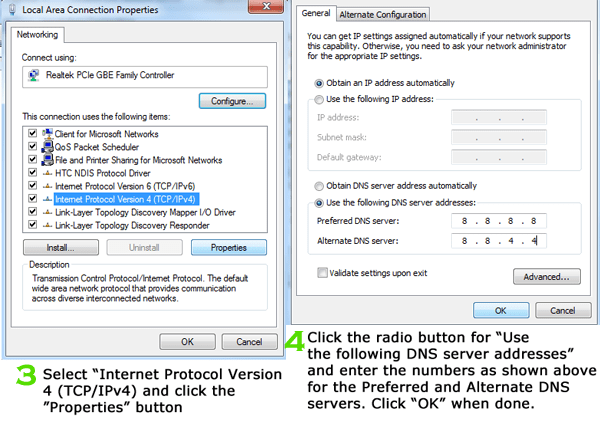 DNS can also be changed directly at the router level, so that all computers on a network are properly re-directed. But because routers can vary, those who are not familiar with them should call a professional like C! Tech Solutions. For more information about C! Tech Solutions, check out their website at http://www.ctechsinc.com/. Find them on Facebook at https://www.facebook.com/pages/C-Tech-Solutions-Computer-Repair-Service-Support-and-Consulting/64339151210 and on Twitter at https://twitter.com/ctechsinc.